Petroleum products are used for transportation fuels, electricity production, and heating fuels. About 1 percent of the electricity generated in the United States uses petroleum as the fuel source for electricity generation. In this application, petroleum is combusted in a boiler to produce steam that turns a steam turbine connected to a generator. Petroleum, primarily as distillate fuel oil and liquefied petroleum gas, is used for space heating, largely in the northeastern United States. It is also used for industrial process heat. In these applications, petroleum fuels are combusted in boilers to produce hot water or steam, burned directly to heat the air or used as material being processed. Petroleum constitutes 30 percent of end-use energy consumption in Idaho. Although liquid fuels are produced in Idaho for transportation use, 100 percent of petroleum utilized in Idaho comes from out of the state. Exploration for crude oil began in 1903 in Idaho, but, despite promising geology in the state’s southeast and southwest, no commercial reserves were discovered or produced until recently. 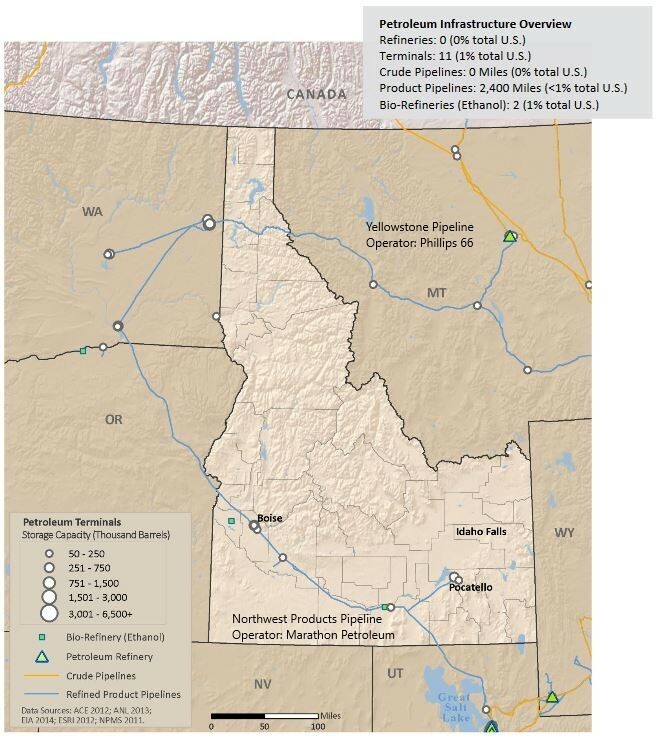 See more information regarding oil and gas development in Idaho below. Average gasoline prices in Idaho were the 46th highest among U.S. states in October of 2015. However, each state has a different state fuel tax and gasoline price rankings can change rapidly and significantly. In 2015, the Idaho legislature approved an increase in the state’s gasoline tax rate, from 25 cents per gallon to 32 cents per gallon. Idaho’s state gasoline taxes are 11 cents higher than the recent national average of 21 cents. Additionally, the cost of shipping transportation fuels into Idaho, which has no refineries, are included in gasoline prices. From 1903 to 1988, approximately 145 wells were drilled throughout the state, exploring for hydrocarbons. In 2010, Bridge Resources (later renamed Idaho Natural Resources Corporation) drilled 11 wells in Payette County, which were later purchased by Natural Resources Corporation and Alta Mesa Idaho. Starting in 2013, Alta Mesa Idaho started conducting exploration and drilling for new wells. As of 2019, there are 20 active drill permits, with 8 wells in production. For more information on Oil and Gas development in Idaho, please visit the Idaho Department of Lands website at www.ogcc.Idaho.gov. 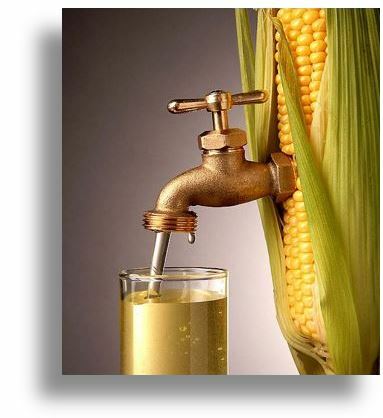 Ethanol is a renewable fuel made from corn and other plant materials, known as “biomass”. 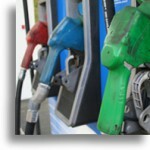 Almost all of the gasoline in the U.S. contains some ethanol. Ethanol is available as E85—a high-level ethanol blend containing 51%-83% ethanol depending on season and geography—for use in flexible fuel vehicles. E15 is defined by the Environmental Protection Agency as a blend of 10%-15% ethanol with gasoline. It is an approved ethanol blend for model year vehicles 2001 and newer. Idaho currently has one plant, Pacific Ethanol in Burley, that is producing ethanol. Pacific Ethanol produces over 60 million gallons of ethanol a year, derived from a corn-based feedstock. Biodiesel fuel is an alternative diesel made from renewable resources such as vegetable oils (soy, corn, canola, mustard, etc), animal fats (tallow, lard, etc), and recycled cooking greases (grease, cooking oil, etc). Biodiesel can be used in pure form or blended with petroleum diesel at any level. The B number indicates the percentage of biofuel. For instance B20 is a blend of 20 percent biodiesel and 80 percent petroleum diesel. The University of Idaho pioneered and continues to be a worldwide leader in biodiesel research. Electric vehicle (EV) ownership has been increasing. This increase can be linked to significant advances in battery performance and EV range; a desire to achieve domestic energy independence; and a wish to reduce environmental impacts. To be considered an EV, a vehicle must run completely on an electrically charged battery, without the help of a gas-powered engine. EVs may also be referred to as plug-in electric cars which describes the process of recharging the battery once the electric charge has been depleted. There are hybrid cars in the current market that use a combination of a gas-powered engine and either a plug-in electrically charged battery or a battery that recharges from the use of the gas engine. Idaho’s rural geography has proven a challenge to the local EV market that is looking to increase their adoption rates. There are efforts underway by several entities to add electric vehicle charging infrastructure to many of Idaho’s roadways, to address this challenge. OEMR, Idaho’s Department of Environmental Quality (DEQ) and Idaho’s Transportation Department (ITD) are working together on a program to add DC fast chargers along the state’s major travel corridors. 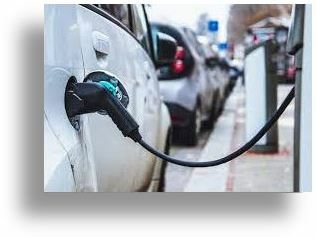 Please follow this link to DEQ’s website for more information about the Electric Vehicle Supply Equipment (EVSE) program. EV owners have a variety of charging options that require differing types of infrastructure. For example, EV’s can be charged overnight via common 120-volt outlets, also called Level 1 chargers. Level 2 charging stations have a 240-volt capacity, which can be affordably installed at residences, businesses or fleet locations to charge at a faster rate (about 3-5 hours for a full charge). Direct charge or DC “fast-chargers” require a specialized 480-volt outlet and can provide a full charge after about 20-30 minutes. DC fast chargers are the most popular on-the-go option for EV owners. Similar to other electrical plugs and outlets, countries differ on what type of plug and corresponding outlet will work in the equipment produced by that country. CHAdeMO (pronounced Chad-eh-Mo), SAE and J1772 are all specific regional standards to which plug in ports or outlets in an EV are built to. These outlets in the EV are where owners plug in a charger to recharge the car battery. CHAdeMO and SAE plugs are used for DC fast charging. Asian made cars – like Nissan, Kia and Mitsubishi – are made with the CHAdeMO standard outlets in their cars. American and European made cars – like Chevrolet, VW and BMW – are made with the SAE standard outlets. Tesla made cars come with their own type of standard for plugs and outlets which prevents the more generic EVs that use CHAdeMO and SAE plugs from using Tesla chargers. Similarly, CHAdeMO plugs will not work for SAE outlets and vice versa. Level 2 chargers use a J1772 standard plug, while a Level 1 plug is a standard electric plug used for most electronic devices. All current EV models can charge at a Level 2 charger that uses the J1772 plug. These lower level chargers do not require the higher voltage needed to charge a car quickly, therefore, their technology is simpler. See the table below for pictures of what each outlet looks like. Plug Share – Map of current electric vehicle charging stations available to the public.